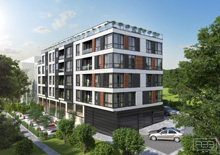 We offer you four - two bedroom apartments with areas ranging from 70 to 95 m2 in Alen Mak, Varna. The apartments are located respectively on the first, second and third floors in a building situated in a gated community since 2008. The complex is located 10 minutes from the beach in Golden Sands. Three of the apartments are sold fully furnished and fully equipped. The apartment on the third floor is partially furnished. Each apartment has a parking space! There is regular bus transport to and from the complex as well as shops and hotels.